Pinterest is a social bookmarking site that lets userscreate a virtual “pinboard” of images or videos to share with others .. With Pinterest, you can follow boards you find interesting, categorize your images, search for inspiration and like images saved by others. Pinterest saves your images with a link to the original site you found it on, so you can come back to your boards later and click the pin to get more information. Pinterest was one of the most heavily trafficked sites of 2011 (we admit, it gets addicting!). While it’s great for personal use, Pinterest can be used for businesses too!. Below are some ways you can build up your brand using Pinterest. Many of the images saved on Pinterest are product photos from online stores, making it great promotion for an online retailer. Saving your product images to the site could be an instant boost in traffic to your store or help you sell more of a product that wasn’t doing as well as you hoped it would. It doesn’t matter if you sell handmade necklaces on Etsy or you are a large online retailer; the potential to have your products seen by thousands of people is the same! Tip when pinning product images: In the description, add a $ and the price and Pinterest will create a price banner around the pin automatically! 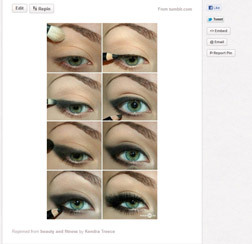 Along with product images, Pinterest is great for visually learning how to do something. Brands can take advantage of this by creating how to images, infographs, or charts to share. Give people a step by step tutorial on how to apply your eye makeup, make an infograph of your company’s history or share a chart filled with statistics. Lots of brands are on Pinterest engaging their users with visually appealing content and inspiration. Several companies are on Pinterest, such as Whole Foods, Lands End and West Elm. You can create your own company board and share inspirational ideas, tutorials or images of your products. It’s a great way for people to see what you have to offer. A great way to get in front of your audience is to play to their vanity. Have a clothing store? Feature customers in your clothing and talk about how great they look. Are you a wedding photographer? Show off photos of the wedding session you did last weekend. This will get your current customers excited and give potential customers inspiration for projects and ideas they may need your help with. These are just a few of the ways companies can use Pinterest to promote their brand. Are your currently using Pinterest? What do you think about the site? Would it work for your company?